One of the biggest challenges I have with writing recipe posts is the fact that Sarah and I often “riff” on recipes. In other words, we’ll take a recipe we found somewhere – often written down by hand or ripped out of a magazine – and rather than making it word-for-word, we’ll improvise, often on the fly. 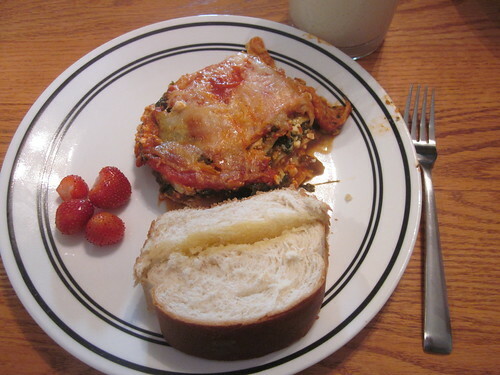 This was definitely the case with this spinach, pesto, and cheese lasagna. I had a nice picture with all of the ingredients on it, but as we started making the recipe (found in an old cookbook), we also began to modify it, resulting in different ingredients and a much different (but very tasty) end product. Even better, most of our modifications actually saved money on the dish. 1. 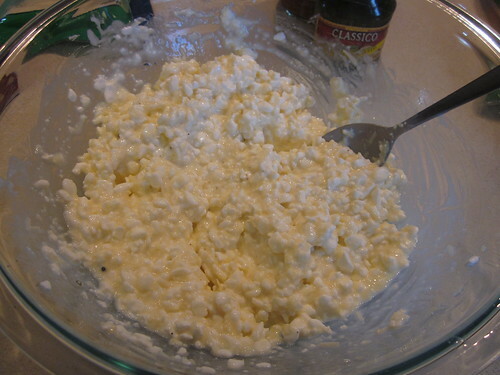 Mix the ricotta and Parmesan cheeses in a bowl together, as above. Salt and pepper the cheese to your taste. For us, that usually means just adding a lot of pepper, as we usually only add salt once a dish has arrived at the table and have tasted it. 2. Crack the egg and mix it in until it’s all consistent and a bit gooey. 3. 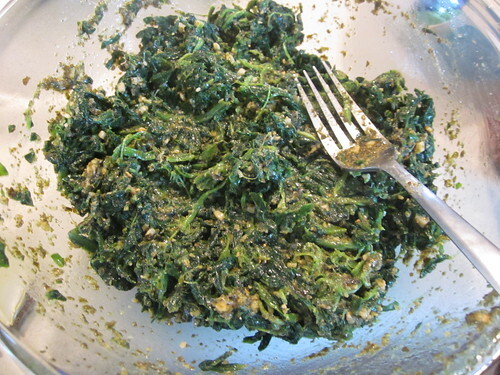 In another bowl, mix together the spinach and the pesto. 4. In a 9″ by 13″ baking pan, lightly coat with the oil of your choice. To prevent sticking – just put a dab of oil on a cloth or paper towel and rub it all over the inside of the pan. Put a cup of pasta sauce in the pan, put three pasta noodles side by side on top of the sauce, spread about a third of the ricotta mix over the top of that, then drop a third of the spinach-pesto mix on top of that in spoonfuls (you can’t spread it over the ricotta, so just put little dabs of it evenly. 6. Repeat the layers twice more and top with the remaining three noodles and the remaining sauce. You’re pretty much ready to go (and you can do all of this in the morning before you go and keep it in the fridge – just add 10 minutes or so to the first baking time). 7. Turn on your oven to 350 F, cover with foil, and bake for 35 minutes. 8. 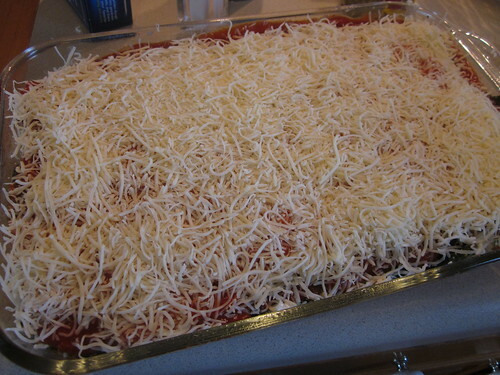 Take the lasagna out of the oven, uncover it, and sprinkle on the Fontina cheese. Then bake it again, uncovered, for about ten minutes or until it’s nice and warm all the way through. We served it with some garlic bread and some fresh cherry tomatoes from our garden. 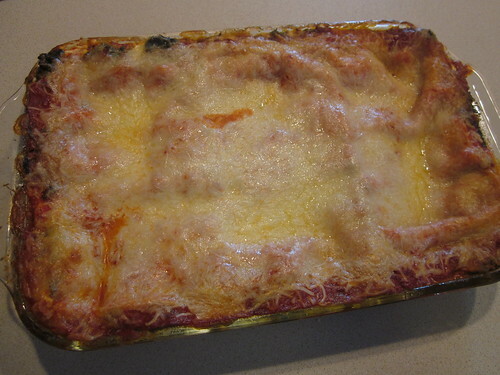 Since this made such a large pan, we were able to eat this lasagna for twelve different individual meals – the four of us at dinner the first night, my wife and I at lunch the next day, the four of us at “leftover variety” dinner the night after that, and my wife and I again for lunch on the third day. This drove the cost per serving for the lasagna down to about $0.65. Was it a hit? Absolutely. The children (and the adults) emptied their plates.